Long champ is French and pronounced Long-shamp. People go crazy over Longchamp bags and I would like to take a moment to tell you why they deserve the popularity. The history behind Longchamp is as fascinating as their bags. Longchamp is a French luxury leather goods company founded in Paris in 1948, by Jean Cassegrain. The Longchamp House is still owned and operated by the family. The company is primarily known for its leather and canvas handbags, its travel items, and various accessories. The brand is present all over the world because it is carried in various boutiques and stores globally. Jean Cassegrain is the creater and founder of Longchamp. He owned a tobacco shop in 1940 and started his company (Jean Cassegrain et Compagnie) in 1948 to broaden the distribution of his leather-covered items for smokers. The products were marketed under the Longchamp brand, which happens to be the name of the racetrack in the Bois de Boulogne, another company was already using the name Cassegrain. This is the reason for the horse racing logo. In 1955 the small family business extended its talents to small leather goods. In the 1960s, Longchamp began to sell leather and nylon fabric luggage. Longchamp knows a thing or two about travelling bags and is the reason why the canvas material is so light. The fabric is enginered to travel and why their bags feel so luxourious not to mention that each bag is hand made in their workshops. In 1971 the brand launched its first handbag for women. Little by little, the company began focusing on leather goods and luggage, and in 1978 the items for smokers were no longer for sale. After the death of the Jean Cassegrain in 1972, then of his wife Renée in 1980, management of the company was taken over by their son Philippe Cassegrain. In 1993, Philippe Cassegrain designed Le Pliage, a nylon fabric tote bag whose handles and flap are made of leather and that folds so that it can be stored flat. The bag's simple shape and the wide choice of colors offered is what made it the brand's most successful product. Longchamp is managed today by the 2nd and 3rd generations of the family. Initially, Jean Cassegrain purchased items for smokers (mostly pipes) and had them covered with leather by Parisian craftsmen. Faced with the brand’s success, and to support the diversification of the products, he decided to create a workshop. In 1959 Longchamp’s first workshop was founded in Segré. Longchamp is celebrating 65 years in business along with its great history in bag design. 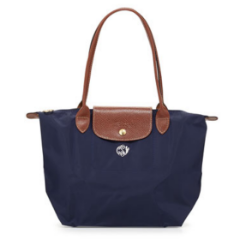 Whether you are traveling, going to work, school, or to the gym and carry a Longchamp, appreciate where it came from. Handcrafted, lightweight fabrics, timeless, and luxourious designs are a few of the many reasons people adore the brand. My favorite affiliations of its history are the use of cigars and race tracks because I can imagine what life would have been back then. Learning the Longchamp story makes me appreciate its roots even more. The next time you are walking through the department store and spot a Longchamp, try it on and maybe pretend to smoke a pipe? Aside from purchasing a bag, it would be a great way to tell its amazing story! Oct 31 The "Witches Hat"